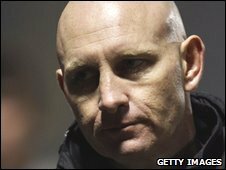 Barnet have appointed former Gillingham manager Mark Stimson as their new boss. The 42-year-old left the Gills in the wake of their relegation to League Two, having taken them up to League One 12 months previously. Bees chairman Tony Kleanthous told the club website: "We have chosen Mark mainly because of his experience in the game and at our level." Stimson told BBC London 94.9: "We all want to do as well as we can and win as many football matches as possible." He added: "I've been given the job for a reason and this is a fantastic challenge at Barnet. "I've been to the training ground and seen an amazing set up. "I've met the chairman and other people at the club. "They've got the beliefs that I've got about how the game should be played and we look forward to putting those into practise." Stimson will be joined at Underhill by his Gillingham assistant Scott Barrett. The pair will team up with new first-team coach Michael Stone and former caretaker boss Paul Fairclough, under whose leadership the club maintained their Football League status on the last day of the season.